Low back pain is probably the most frequent reason to visit doctors around world. In India patient loves taking pain killer without knowing the reasons for such pain. Many patient’s keeps on taking medicine for ages with little knowledge of harm it is doing to them. Chronic low back pain is neither a simple disease nor has simple solution. We would advise to take expert opinion on diagnosis & then start treatment as a small muscular sprain may be just a symptom of underlying serious disease. Pain may arise from damage or irritation to structures of the lower back including the vertebrae (bony spine), facet joints, discs between the vertebrae, vertebral ligaments, muscles of the lower back, spinal cord and peripheral nerves. Thus it is of immense importance to understand & find the reason for such pain, which may be as small as muscular sprain or big as disc or nerve problem. 1.Conservative treatment: Consists of medication & exercises after confirming the problem to be myofascial. 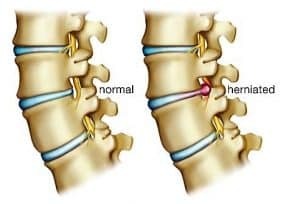 3.Minimally invasive spine treatment: Instead of open spine surgery modern technique and equipments used to address the problem without destruction or destabilizing spine. 4.Open spine surgery: Surgical advise is only given when other modality fails or there are severe complications characterized by bladder and/or bowel incontinence, lower extremity weakness, spasticity, and/or loss of sensation. • Epidural intervention – Epidurals are frequently used for pain syndromes due to common conditions such as degenerative disc disease. 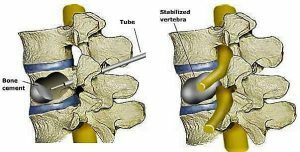 The method involves injecting a anti inflammatory medicine into the epidural space of the spine, where the irritated nerve roots are located. The medicine then spreads to other levels and portions of the spine, reducing inflammation and irritation. • Medial Branch Blocks/Denervation – Medial Branch Blocks (MBBs) are a minimally invasive non-surgical treatment that are used for arthritis-related neck and back pain. The injections work by reducing the inflammation and irritation in the facet joints of the spine that is causing your pain. 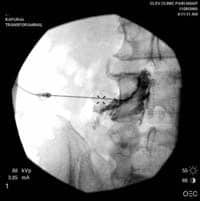 • Infusions Techniques – The procedure involves inserting a small catheter through a needle into the epidural space or directly next to affected nerves. Local anesthetic and other medicines are often given through the catheter for extended time periods. When the nerves are blocked continuously with an infusion, pain relief can be dramatic and long lasting. 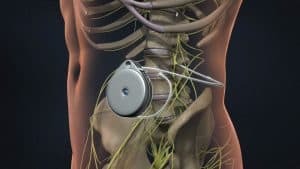 • Peripheral Nerve Blocks and Ablation – Nerves away from the spinal cord are called peripheral nerves. These nerves can often be sources of pain and can be blocked with local anesthetic. When pain relief is obtained, ablation or destruction can be initiated. There are many different minimally invasive spine procedures for back pain. The goal of nearly all procedure is to remove pressure from the nerves of the spine, stop excessive motion between two or more vertebrae or restores the function of spine. The type of Procedure that is best depends on that patient’s conditions and symptoms which requires comprehensive examination & unerstanding of disease. Long-term, surgical fusion or discectomy may not provide relief. In addition, surgical options for LBP were found to be associated with a significant risk of complications, including bleeding, nerve damage, epidural scarring, and prolonged recovery times. The evidence at the present time does not support routine surgical fusion or surgery for the treatment of chronic lower back pain alone.There have been great strides in back pain treatments and interventional pain medicine. Early intervention can make a big difference. o Early intervention for the management of acute low back pain: a single-blind randomized controlled trial of biopsychosocial education, manual therapy, and exercise. PMID: 15507794. Spine. 2004 Nov 1;29(21):2350-6.
o Surgical management of neck and low back pain. PMID: 17445741 Neurol Clin. 2007 May;25(2):507-22. Clinical Trials: 2007;10;425-440.